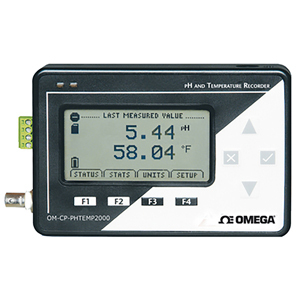 The OM-CP-PHTEMP2000 is a battery powered, stand alone pH and temperature data logger with an LCD. The OM-CP-PHTEMP2000 will directly connect to many commonly used pH, ORP and ISE electrodes through a female BNC connector mounted on its side. Temperature compensation is done automatically by connecting an RTD to the unit. The storage medium is non-volatile solid state memory, providing maximum data security even if the battery becomes discharged. The OM-CP-PHTEMP2000 makes data retrieval quick and easy. Simply plug it into an empty com port and our user-friendly software does the rest. 참고: Operator’s manual and USB cable are included with the OM-CP-IFC200 (software is required to operate the data logger and is sold separately).